multiple revisions to the sixth paragraph. expansive, triple-A games of the highest quality. impact of innovative game development. growth opportunities, innovation, and impact in the markets they serve. and is among the world’s top funders of conservation impact philanthropy. For more information visit: www.ascendantstudios.com. and become a fan on Facebook. company is at work on its first title. 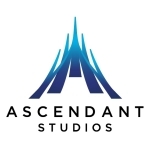 Visit www.ascendantstudios.com.